Janella Salvador and Jameson Blake agree in saying that their team-up in the upcoming movie, So Connected, is significant for both of them. For one, this is their first time to work together. For his part, Jameson explains that he has always been vocal in his past interviews that Janella is her dream leading lady. “Before, people would always ask me, ‘If you would work with a leading lady, who would you choose?’ I’m like, ‘Maybe Janella, I think maybe we’d be a good match for a movie.’ “I’m like, ‘Someday baka may movie kami ni Janella. Maybe it would come true.’ I actually dreamt about it,” the Hashtags member recounts. “I never really expected it would come true,” he enthuses about his granted wish. The budding actor also points out why So Connected is a huge milestone in his showbiz career: What could be better than finally getting your first big role and be paired with your dream leading lady? “Ito so far ang pinakamalaking role ko as a bida sa mainstream. Kasi nag-indie [movie] ako, so ito mainstream na ito. It’s like a big step in my life. “It’s really special for me. Kasi I always wanted to work with Janella. and I’m happy it actually came true,” he says with excitement. Though it is their first team-up, Jameson is happy to hear that the staff and crew of the production team is optimismic that his onscreen partnership with Janella shows a lot of promise. “They believe that we could actually pull off the movie. It’s a great experience,” he beams. “They really like the movie,” referring to the production team. Meanwhile, the team up is a breath of fresh air for Janella. She only has good words for Jameson. “He’s very nice, actually. I have no problem working with him at all because sobrang light lang ng aura niya, sobrang good vibes lang, and masaya siya to work with,” she commends. Coming from a solid love team in the previous Regal Entertainment movie, Janella admits that she had to adjust in working with a new leading man in the person of Jameson. However, she welcomes this change because this will only help her to a better actress. “Syempre, may adjustment. Medyo after a few projects with the same leading man, di ako sanay na bago, pero it’s always nice to try something new. I think it’s good growth din as an actress,” she articulates. Janella’s role in the movie is Trisha, a self-supporting young woman, who hopes to help her family. Popularly known for portraying teeny bopper roles, Janella finally gets the chance toportray an out-of-the-box character. “Nag-enjoy ako dito sa role na ‘to kasi nga it’s something different for me, kasi halos lahat ng roles na ginawa ko before maarte o kaya younger. “Ito, hindi lang mature. Mas jologs talaga yung character ko. Sobrang jologs niya,” she giggles. Jameson, on the other hand, portrays Karter, a video editor for a web channel who finds himself falling for a complete stranger (Trisha) after he gets a glimpse of her life in videos and photos uploaded in the online world. Just like Janella, Jameson also feels connected to his role. “May mga similarities kami; I’m shy and quiet minsan. I just want to be on the computer a lot. I’m just like him; his attitude and the way how he approaches different kinds of situation. I didn’t have much adjustments to it,” describes the actor. 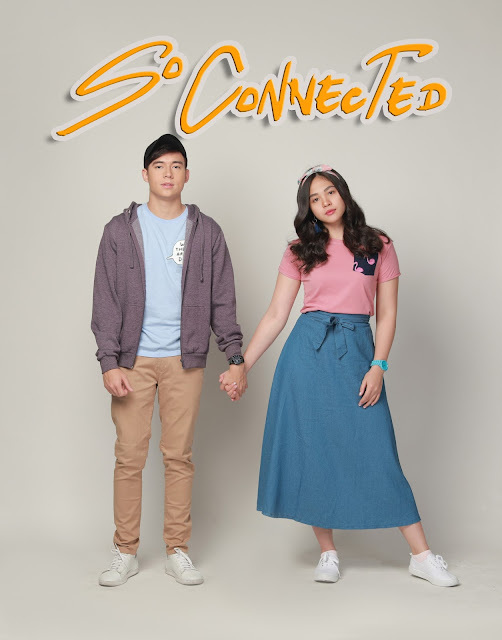 So Connected, which is produced by Regal Entertainment, Inc. and directed by Jason Paul Laxamana will be showing in cinemas on May 23. The film also stars Ruby Rodriguez, Rolando Inocencio, Cherise Castro, Krystal Brimner, Paulo Angeles, VJ Mendoza, Chai Fonacier, Rafael Sudayan and is directed by the highly-respected Jason Paul Laxamana. For more updates, follow Regal Entertainment Inc on Facebook, @RegalFilms on Twitter, @RegalFilms50 on IG and Regal Cinema channel on Youtube.